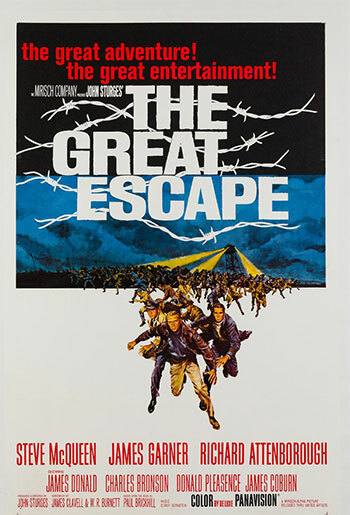 The Great Escape - 55th Anniversary! This film is a part of an epic Double Feature with The Bridge on the River Kwai. When two movies that are screening in the same theatre are grouped under the same thematic heading, one ticket is good for both features when viewed back-to-back on the same day (except as noted). Steve McQueen, James Garner, Richard Attenborough, Charles Bronson, Donald Pleasence, and James Coburn. After recapturing an intrepid group of escaped POWs, among whom are Steve McQueen, James Garner, and Charles Bronson, the Nazis lock them up in a remote, “escape-proof” prison camp. If you think that’ll hold ‘em, you may want to reread the title. Based, believe it or not, on a true story.